The Rt. Rev. 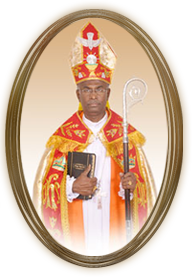 J.J. Christdoss is the Bishop in Tirunelveli, Church of South India since 30th August 2009. He was born to Mr. P.D. Jeyaraj on 31st March 1953 at Korampallam of Thoothukudi District. He was ordained as Deacon on 11th June 1986 at St Peter’s Church, Shunmugapuram and ordained as Presbyter on 11th June 1987 at Holy Trinity Church, Idaiyangudi by Church of South India, Tirunelveli Diocese. The Rt. Rev. J.J. Christdoss did his BD course in the year 1982 at Tamilnadu Theological College, Arasaradi, M. Th Communication course in the year1998 at Tamilnadu Theological College, Arasaradi, Serampore University and M. A. Sociology in the year1992, Annamalai University. Rt. Rev. J.J. Christdoss married Mrs. Christilda and the couple have 3 daughters. The eldest daughter, Hannah 22 years, Christine Annie 18 years, and the youngest daughter Juliet 11 years.